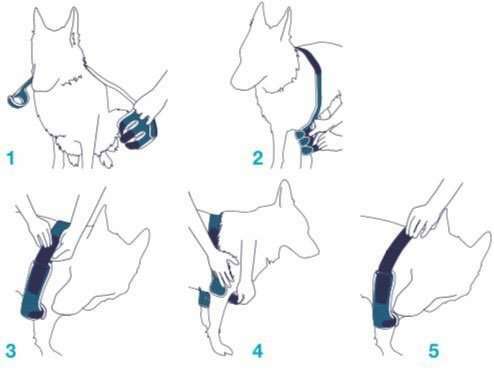 Designed to protect the dog’s elbow, the brace is used in cases of hygromas, sores and calluses on the elbow. It is fitted with comfortable replaceable padding. BT Soft is the perfect companion for looking after the dog’s elbow. BT SOFT is designed to protect the dog in cases of hygromas, sores, calluses on the elbow and bursitis. The brace is also ideal for use in the presence of conditions such as arthritis, arthrosis or elbow displasia. This is because the compression it provides increases the blood pressure in the area, thus raising the temperature and reducing the pain caused by the conditions. It keeps the injured area compressed and is extremely efficient also to protect medications applied to the skin after surgery. With its replaceable padding, the BT Soft brace combines top performance with maximum comfort. Used after surgery, it facilitates recovery in trouble-free convalescence.